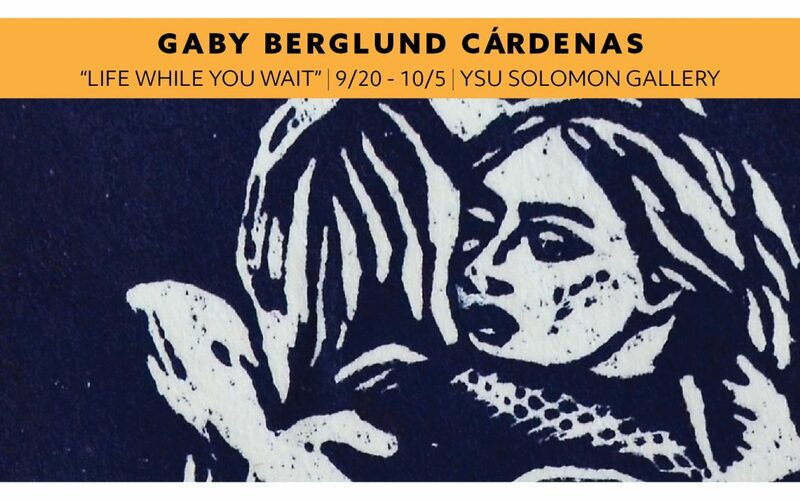 Opening reception is Thursday, September 20, 5:00 p.m.
Youngstown, OH…Youngstown State University’s Department of Art will host guest artist Gaby Berglund Cárdenas as her exhibition, Life As You Wait, opens in Bliss Hall’s Judith Rae Solomon Gallery on Thursday, September 20 through October 5. An opening reception will take place at 5:00 p.m. that day which is free and open to the public. Gaby Berglund Cárdenas is an international multi-disciplinary artist. Her artistic practice straddles between disparate worlds: the big city of Houston, where she currently lives as an expat; her birthplace Ecuador, where her family lives; Sweden, where home is; and South Korea which has influenced her spirit after living there almost nine years. In 2012 she earned a MFA majoring in oil painting at Kyungsung University in Busan, South Korea with further printmaking studies. Since then, she has been actively exhibiting internationally in prestigious galleries and museums such as Edward Hopper House of Art in NYC; Koehnline Museum of Art in Chicago, IL, The Beaney Museum of Canterbury in UK, Hangaram Museum in Seoul, South Korea and the Lawndale Art Center in Houston. Through her art she addresses the human condition, the female body, and the realms of spirituality in work spanning mediums from paintings and printmaking to installation, textiles and artist’s books. Cárdenas works from her studio in Houston, and is a member of PrintMatters and the Burning Bones Press in Houston. Cárdenas is also represented by Grafik i Väst in Gothenburg, Sweden where she’ll be moving next year. Important upcoming projects include a solo exhibition at the Carl Jung Center in Houston in February of 2019 and a participation in the collective show “Nevertheless She Persisted” at the Koehnline Museum of Art in Chicago, IL this month. 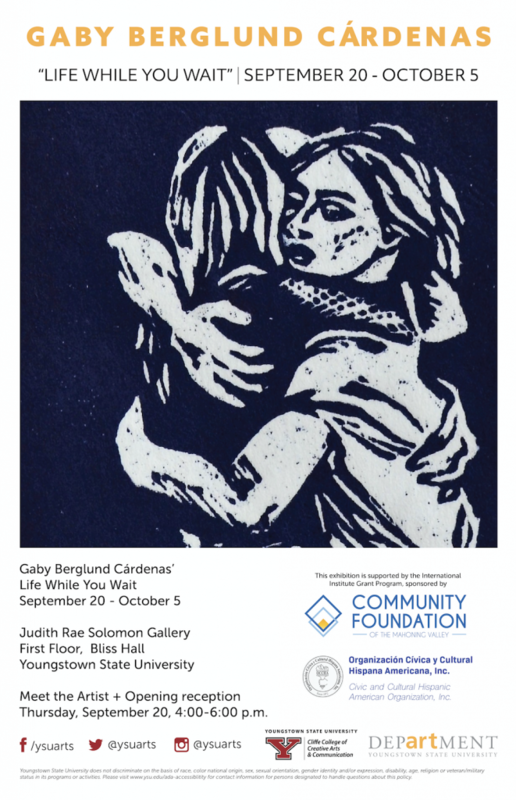 Berglund Cárdenas’ exhibition is part of Hispanic Heritage Month, supported by the Community Foundation of the Mahoning Valley. Parking is available in the M30 Wick Avenue parking deck for a nominal fee. More information is available by calling the Office of Community Engagement and Events at 330-941-2307. A complete calendar of events is available at www.ysu.edu. CLICK IMAGE BELOW TO DOWNLOAD A PRINT-READY PDF.